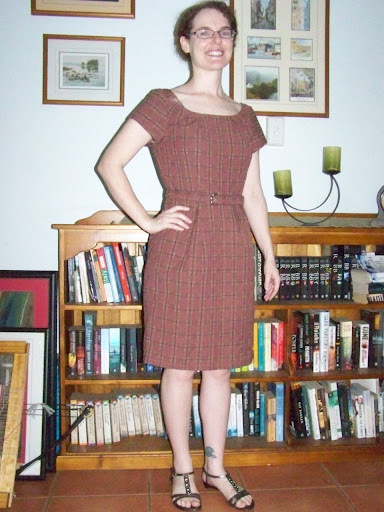 It looks ok in the pictures, and indeed it looked ok on me, but for some reason I just never liked it. I think the colour wasn’t the best on me. And the back walking-vent was too high to be practical modesty-wise. It took a one-way trip to the Op-Shop when I eventually got sick of it sitting unworn in my wardrobe. I hope whoever got it enjoyed wearing it. 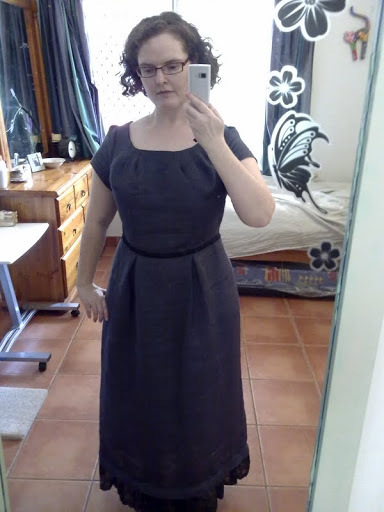 So I made it up as a long dress… only to realise the skirt wasn’t quite long enough to be Long. No matter though! I could suddenly see its True Potential. I could add a wide lace mock-underskirt to it to make it Long, and it would lend to the dress a sort of Downton Abbey-ish layered long dress kinda look. Mmmm! I confess, mum bought this fabric for shorts. It’s mostly rayon with about 10% polyester. I, ahem, humbly felt it would be wasted as shorts, and did a bit of negotiation. Since mum only wears shorts to the gym and the like, she was amenable to a fabric swap with something in my stash suitable for shorts for her. YAY! There’s an invisible zip in the back, polyester lace at the waist and cotton eyelet lace at the hem. My layered lace Downton Abby-ish look. I simply sewed the lace underneath the skirt a few inches above the hem. 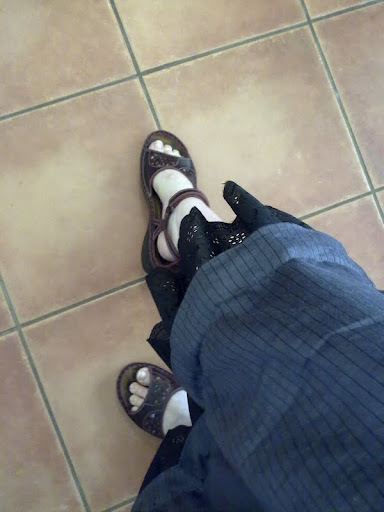 You can see the join-line from the outside, but since the only other alternative for attaching it was a separate underskirt, which would have added another layer and made it too hot to practically wear, I accepted the join-line with good grace. However if anyone has another suggestion as to how to make the lace look layered without an underskirt or join-line, I’d love to hear it…. Close-up of the lovely bodice pleats. I added in a bust dart from the side seam, to accommodate my C-cup bust, but I’m not sure I really needed it. Never mind, the extra ease helps keep it cooler than otherwise. There were a number of people who reviewed this pattern who didn’t like the skirt back pleats over the fullness of their hips. So I tried a different approach. I measured how wide I wanted the skirt to be around my hips and upper thighs, allowing plenty of ease for walking and coolness. 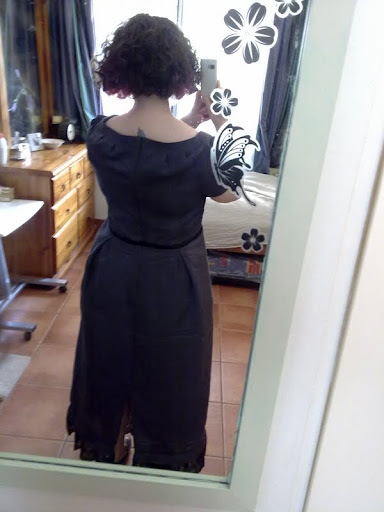 Then I simply sewed it together into a tube, and pleated the extra fabric around the waist, placing the pleat centres directly in line with the bodice’s vertical darts. I rather like it. It looks fine to me. 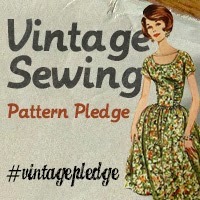 There is enough easy and the fabric is so soft it falls gently over my curves regardless of the pleats over the hips. I also put in a back vent to my knee to allow me to walk, not shuffle. This dress is surprisingly cool to wear. I like this! I was expecting it would be hot due to the polyester in it, but it is thin, and the rayon content is high enough that it is perfectly breathable. It feels a bit prickly though, which is a bit weird, but it isn’t a big issue. 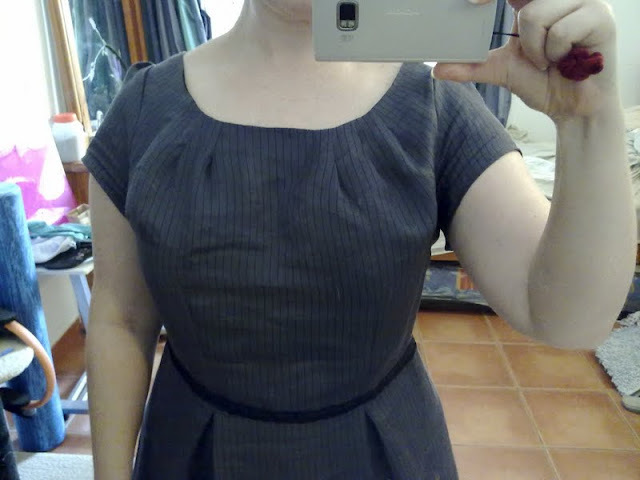 And this is another dress that collects compliments, which is really nice! You were right, a change of colour was what you needed! This version looks both great and practical to wear. It turned out well, and with a colour that flatters your skin tone you won’t get tired of it. The fact that it is cool is a bonus. well done. Thanks Josie! I love the colour, it’s a sort of purple-grey. Very nice! The bodice pleats are ridiculously cute! This looks super rad and the lace trim is a sassy touch 😀 Nicely played, milady!